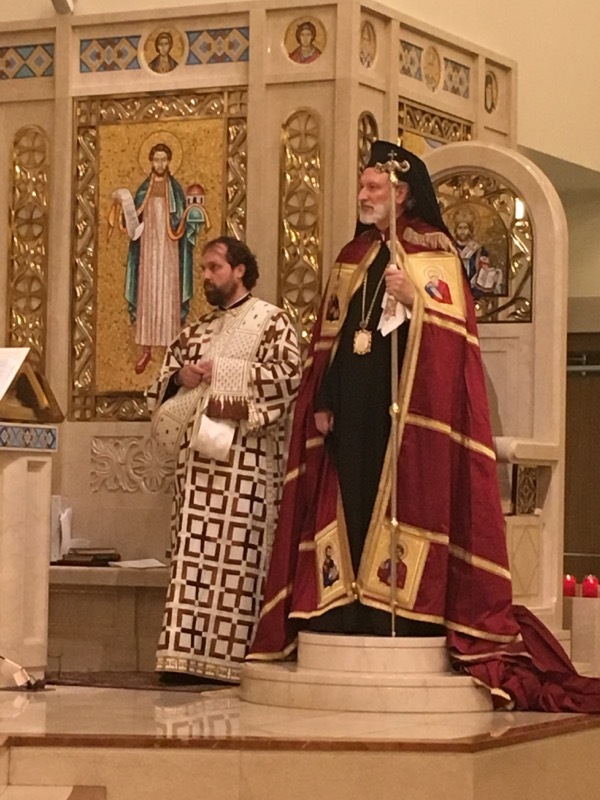 On March 4th, the first Sunday of Great Lent, the Holy Trinity Serbian Orthodox Cathedral of Pittsburgh was honored to have the presence of his Grace Bishop Irinej and Deacon Jovan Aničić to celebrate pontifical Divine Liturgy with Prota Rajko Kosić. 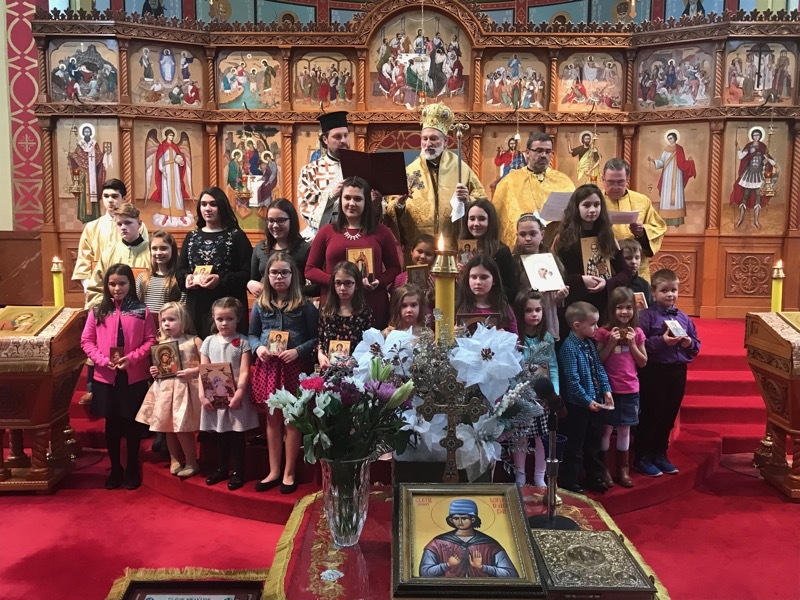 The parishioners and all in attendance participated in the Procession of the Icons behind the church school children, in commemoration of the restoration of the use of icons in our churches after a century of persecution, on the first Sunday of Lent in the year 843. Since that time, on this Sunday of the Triumph of Orthodoxy, all Orthodox Christians proclaim our faith and belief in the one, holy, apostolic truly Orthodox Church. Bishop Irinej’s inspirational and educational homily enlightened all, as did his endearing dialogue with the children of the parish. Following Divine Liturgy, parishioners were welcomed to the coffee room for an opportunity to meet-and-greet Bishop Irinej, where light Lenten pastries and appetizers were served. During that time, Deacon Jovan, the Diocesan Director of Christian Education, met with the Holy Trinity Cathedral church-school coordinator and several instructors to review current religious instructional material and to discuss goals and suggestions for the upcoming church-school year. This opportunity was truly appreciated by all, who were enthused with Deacon Jovan’s knowledge and experience. Later that afternoon, Orthodox Christians from across all jurisdictions gathered at Holy Cross Greek Orthodox Church in Mt. Lebanon, Pennsylvania for Pan-Orthodox Sunday of Orthodoxy Vespers, hosted by the Orthodox Clergy Brotherhood of Greater Pittsburgh, where our own Bishop Irinej was the presiding heirarch and guest speaker. His eloquently delivered, poignantly stated, and emotionally stirring delivery was indeed a proud moment for our Diocese, in the resonant nave of Holy Cross, filled with Orthodox faithful of all jurisdictions, hierarchs, and over twenty priests and other clergy. The evening culminated in a social gathering in the adjacent social center, providing an opportunity for the faithful to enjoy fellowship and conversation, and for the region’s Orthodox Christians to acquaint themselves with our Bishop Irinej. On Monday, March 5th, once again our Bishop was honored as guest lecturer at a Clergy Seminar held at Holy Cross Greek Orthodox Church in Mt. Lebanon, for many Orthodox clergy from the Greater Pittsburgh area. The topic of his lecture was "The Orthodox Mind: A Pastoral Approach to Postmodernity", Based on 1 Cor. 2:16. Bishop Irinej’s visit culminated in attending a Lenten luncheon prepared by the Holy Cross community.